There is only one place in the city of Atlanta that I hold sacred: The Woodruff Arts Center, or, more specifically, Atlanta Symphony Hall. There is no other place in the city, or the region, that triggers an immediate relaxation response. No matter what is happening, how bad the week or year is going, I know with full confidence that I can sit down in those plushy red seats and be enveloped in music. The oboe’s 440 A is a signal that I am to be transported away from the world for the next few hours. After the concert is finished, I am almost always in a completely different mindset than when I walked in. The experience is transformational. For a little background: I attend symphony concerts for a very specific experience. For some works, the entirety of what I want to hear lasts a minute, potentially more. Sometimes it’s one or two cords – for me those cords make the piece, make the whole experience worth it. For Beethoven’s 9th, it occurs in just the first thirty seconds – right before the orchestral round finishes and the symphony joins together, the composition strikes a chord that is, arguably, a few hundred years ahead of its time. It’s a sound I could only imagine being created through a synthesizer. To imagine that the Beethoven was almost completely deaf while writing the piece is mind boggling. In no simple terms, hearing this piece would have been the defining part of October – it would have been a memory that stuck with me throughout my life. After searching for news articles, I discovered the lockout was officially international news. 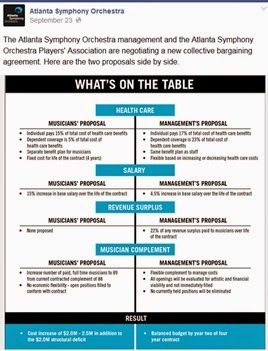 To me the argument is fairly simple; at its core is management’s desire to maintain a financially sustainable orchestra. As for the artists, they want higher compensation for a level of ability that takes a lifetime to acquire, and many sacrifices along the way, higher wages to that will attract the world’s best players, and artistic control over the orchestra –an orchestra’s size and player quality is directly related to the quality of music it produces. Both sides are on solid footing: any debt laden organization will eventually collapse and any organization that can’t provide its very discerning customers with a top-level experience will also collapse, albeit more slowly. The trouble is, both sides I feel, ignore some larger trends which bear thought. In our line of work, we constantly talk about building amenities and places where people want to live. It’s the whole “live first, work second” mentality. At Market Street, quality of place is synonymous with sustainable workforce. Businesses and corporations understand this too; they frequently leverage the amenities within their region to attract talent. Case in point, AT&T is graciously flying my brother out to Dallas, all expenses paid, so that he might take a position with them. You can bet they’ll be showing off their corporate headquarters, you can also bet they’ll be showing off Dallas too. Simply put, with companies ever mindful of amenity development, one wonders whether they will become more selective of the types of philanthropic investments they make. And to the topic at hand, is a symphony orchestra something a millennial seeks out in a community? Will it influence their location decision? One wonders, then, if large corporate investors will continue to support the fine arts, or shift their investments to the types of arts sought after by the up-and-coming workforce. I’d like to think classical music fits the bill, and at symphony hall, the faces are about as young as I’ve seen. The ASO has made great strides in trying to appeal to this base too. Whether it is concerts featuring music from the popular Final Fantasy series or outdoor concerts in Piedmont Park, the need to attract younger audiences to the symphony is not lost on the organization. ASO’s outreach to up-and-coming musicians in the Atlanta region is also second-to-none. I wonder, however, whether this translates into sustainable ticket sales for classical concerts. The other macro trend is that music is now ubiquitous. Music is no longer something that needs to be experienced. And, I readily admit, I am extremely selective about the concerts I attend. I could rattle off about 50 or so pieces, and 10 to 15 composers I’d be willing to go see. Anything outside of that, I’m content to stream music. This is not to say that streaming music is a bad thing, I’ve discovered a ton of new music I wouldn’t have otherwise, but it does take the discovery process out of the music. We’ve already heard the piece about to be played – we go to concerts just so we can experience it live. This places any musical group, orchestra or not, in an awkward position – they have to play the hits (i.e. Beethoven’s 9th) or the audience might not show. The last trend important trend, I’d argue, is that the creative energy that was once behind classical music has gone to other genres. Some of the best classical music I’ve heard in recent years has been either film scores, scores from video games, or from Spotify. This isn’t to denigrate the composition talent that is currently out there, but simply to point out the creative talent is probably messing around with synthesizers. It’s these pressures and not the current battle over the purse string, that have me most concerned about the future of classical music and, consequently, the future of the Atlanta Symphony Orchestra. The genre needs to evolve, to be more excepting of other instruments and ways of generating sound. Moreover, shifting corporate philanthropic interests or a populous that simply doesn’t care about the genre, has me profoundly worried. It is these, much larger trends that both the ASO and its management have to think about. It’s not about giving a shot-in-the-arm to the ASO, but how do you give a shot-in-the-arm to classical music as a whole. It is the central question of our profession: how do you leverage creative destruction to lead change, rather than be debilitated by it? With any transformational effort, it’s about energy, it’s about talent, and it’s about people. Symphony orchestras tend to tune to the oboe. The 440 represents the frequency, the A represents the musical note the orchestra tunes to.